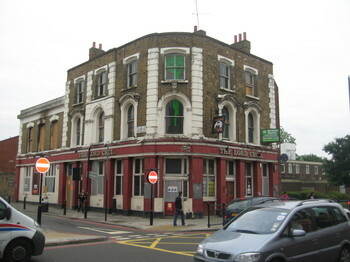 "The Lord Cecil is on an exclusively uniform Victorian terraced stretch of the Lower Clapton road (the corner toward the Round Chapel) it also has the finest Victorian frontage on this road. Demolition would definitely not be beneficial to the area in the long run as adding cheap, crammed apartments never is. One suspects it is only happening here, now, as its not a particularly prosperous neighbourhood, such as those, for example, in Islington, Hampstead or Chelsea. Preservation of good, antique architecture is essential for the future and continuing prosperity of an area as it makes it ultimately worthwhile to invest in." Zac believes the pub is a listed building and now owned by a developer. There was a fire there recently and a neighbour of Zac's acquaintance has noticed damage caused separately to the roof. Does anyone else have information about this? I've been following this closely as the Lord Cecil is in my ward and various constituents plus the Clapton Conservation Area Advisory Committee have been expressing concern. The Council is involved in trying to stop the deterioration of the building and has received initial correspondence from the DCMS, which is continuing to investigate the case for serving an Urgent Works Notice on the building's owner. In the meantime, the owner has contacted the Council to confirm that contractors have been on site making the building watertight. I think the Council has now inspected the building and will of course continue with enforcement action if the remedial works carried out fall short of those required under the Urgent Works Notice request to the DCMS. I'm pretty sure it used to be squatted in and the squatters were turfed out by the developers. This happened a few months ago - around the time the beautiful "quotes of the week" stopped appearing on the chalkboard outside. Meanwhile at the far end of Clifden Road -almost diamterically opposite the Lord Cecil- the Than Long Vietnamese, another fine Victorian former public house and a jolly good budget eat in/takeaway is now boarded up and i wouldnt be surprised if it too is earmarked for demolition and redevelopment as a block of lego buy to lets. I seem to remember a bus ploughed into the place a few years ago. When I first saw the pub it had the wrong Elizabethan on the sign. Possibly Walter Raleigh, but I can't remember. It certainly wasn't a Cecil, though. I happen to live very close to the Cecil and I've witnessed kids smashing in the windows as they walked past and believe the fire was definitely deliberate. On the day the fire happened it was not even closely warm enough to make it out as an accident. They have also been kicking in the roof to let the building rott from the inside and get it ready for demolition (as others here have already stated). That's just what we need: another annoying building site and one of these hideous, new buildings by money-hungry developers! I have spoken to the English Conservation Society and mailed them some pictures of the burning Cecil. They have expressed concern and are fully aware of what the developers are trying to do. I am not sure whether I believe there are any squatters in there right now. I haven't seen anyone so far, but guess that would be a good thing as they could safeguard the building. I've witnessed kids smashing in the windows of the Cecil and do believe the fire was deliberate. It seems they have also tried to kick in the roof to let the building rott from the inside and get it ready for demolition. That's just what we need: another annoying building site and one of those hideous, new buildings (as if London doesn't already have enough of them!) by money-hungry developers. I have spoken to the Conservation Society and mailed them some pictures of the burning Cecil. They have expressed concern and seemed aware of the situation. I don't think there are any squatters in there right now. I haven't seen any so far, but do believe that would be a good thing as they could help safeguard the building. Well, the kids didn't remove the roof tiles, nor did the squatters judging by the repair attempt. The fire? well its a major way to delist a building and make a plea for demolition if you own it. I saw this occur on a massive scale in Harlem, NY. There was a insurance to claim for as well (bonus). The decline of public houses has been brought about by managers wanting to make a quick killing and f--k off. The Lord Cecil is no different. Now those that abhor alcohol are buying up the pubs and destroying a part of our heritage and so it begins.